• Ideal For Mixing Dry & Wet Material. • Paddles Type Blades So Arranged On The Shaft To Give Through Uniform Mixing Of Thick Heavy Material. • The Drive System Is Through Suitable Worm Gear And Motor. • Provision For Tilting Arrangement , Reversible Switch And Safety Lock-switch To Stop The Mixer As Soon The Cover Is Opened. • PTFE Gland Mechanism Provided at Shaft ends to Prevent Inner Leakage. 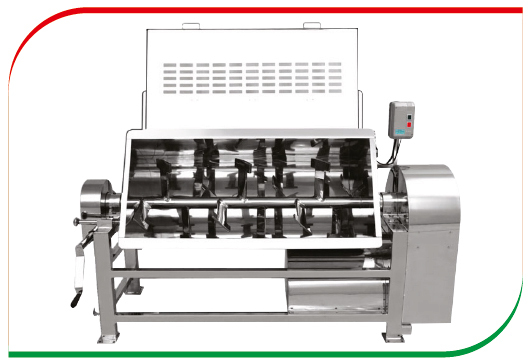 • The Mass Mixer Is Also Provided With A Lever With Hand Wheel To Accomplish Tilting Manually.